Known by many names across the centuries, the werewolf leaps from the pages of legend to terrorize us with its woolen ferocity! Pretty scary, right? This is my latest project, the Wolfman. He’s inspired by the Universal Pictures version of the werewolf legend – you know, Lon Chaney, Jr. gets bitten by fate (get it? he gets bitten!) and transformed into a monster. Puns aside, this was a challenging piece. His head was uncooperative and it took a little finagling to get his arms oriented with just the right amount of menace. Though, the cat brothers don’t seem scared of him at all… well, at least while the lights are on. 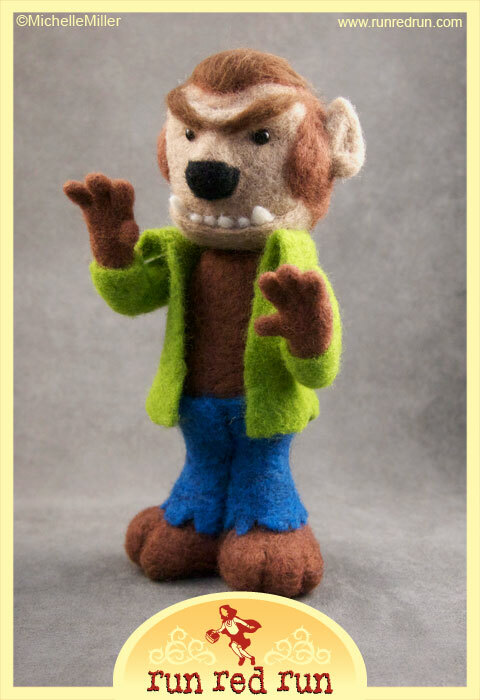 Check out the gallery for more Wolfman photos!